Improving medications management in Australia is a key objective of the National Quality Use of Medicine's Strategy and the National Medicine's Policy. eMedication Management seeks to support these policies and objectives by improving the quality and availability of medications-related information. The Medicines Safety Program is designed to improve the access and quality of medicines information through the use of digital health, enabling consumers and healthcare providers to make safe, informed decisions and achieve better health outcomes. The 2nd meeting of the Medicines Safety Program Steering Group was held in Brisbane on Wednesday 15 February 2017 with 28 members in attendance. The Australian Digital Health Agency is pleased to announce the establishment of a new Medicines Safety Program. Good medicines management can help to reduce the likelihood of medication errors and hence patient harm. The Program is designed to improve the access and quality of medicines information through the use of digital health, enabling consumers and healthcare providers to make safe, informed decisions and achieve better health outcomes. Electronic Transfer of Prescriptions (ETP) is a subset of eMedication Management in which your Desktop Software creates and sends electronic prescription information (ePrescriptions). These electronic script copies will be sent to a Prescription Exchange Service (PES) where they are stored and can be retrieved later by a dispenser at the time of dispensing. When a prescriber (doctor, specialist, dentist etc.) generates an ePrescription two things happen - an electronic copy of the prescription is submitted to the Prescription Exchange Service (PES); and a unique barcode is generated and printed on the paper prescription. When the patient takes the paper prescription to the participating pharmacy, the pharmacist will scan the barcode which automatically retrieves the prescription details from the PES. This information automatically populates the fields in the pharmacy dispensing system, saving time and reducing the likelihood of errors. In cases where the pharmacy is not using ePrescriptions the medication is dispensed via the standard methods of manually transcribing the prescription details into the pharmacy's system. What is the Prescription Exchange Service (PES)? The Prescription Exchange Service or PES is a storage system for ePrescriptions that have been prescribed and are waiting to be dispensed by the pharmacy. There are currently two PES systems operating in Australia – eRx Script Exchange and MediSecure. Each PES system is required to meet specific standards set by the Commonwealth Government which relate to security and privacy. A prescriber or dispenser may be connected to one, or both PES systems. In order to send copies of prescriptions electronically to a PES, your practice should have an agreement with a PES. The PES providers may have varying terms and conditions and it is important that your practice understands and accepts them. Electronic Transfer of Prescriptions (ETP) and the Prescription Exchange Service (PES) are essential components for prescription and dispense records to flow into the My Health Record system. If a patient has a My Health Record and their healthcare provider is using Electronic Transfer of Prescriptions (ETP) and is registered with the My Health Record system, a copy of the prescription information will flow through to the My Health Record system via the PES and be visible in the Prescription and Dispense View (as long as the patient has not withdrawn their consent for the information to be uploaded). 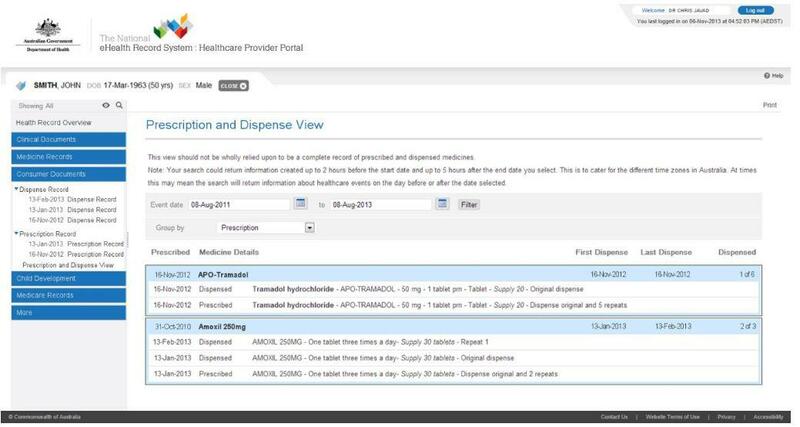 See the Software Demonstrations; for examples of uploading and viewing prescription information into the My Health Record system using clinical software. Similar to prescribers, dispensers, through their updated software, will be able to send dispense information to the PES and onto the My Health Record system where it will be visible in the Prescription and Dispense View. The Prescription and Dispense View in the My Health Record system allows individuals and their healthcare providers to easily view details of their prescribed and dispensed medications. The view displays the name and date a medication has been prescribed and dispensed (both the brand name as well as the active ingredient/s), the strength of the medication (e.g. 2mg, 20mg, etc. ), the direction for consumption (e.g. take one capsule daily) and the form of the medication prescribed (e.g. capsule, tablet, inhaler, etc.). Over time, the view will capture the history of a patient's medication details. Through this approach, all authorised healthcare providers, i.e. not just the prescriber and dispenser, will be able to view patients' prescription and dispense information through the My Health Record system. This innovation will provide significant value to healthcare by providing medicines information about their patients.